Swedish company Arla, who make "skyr" which is manufactured in Germany with an advertising campaign shot on location in Iceland, are claiming that the product is Icelandic. 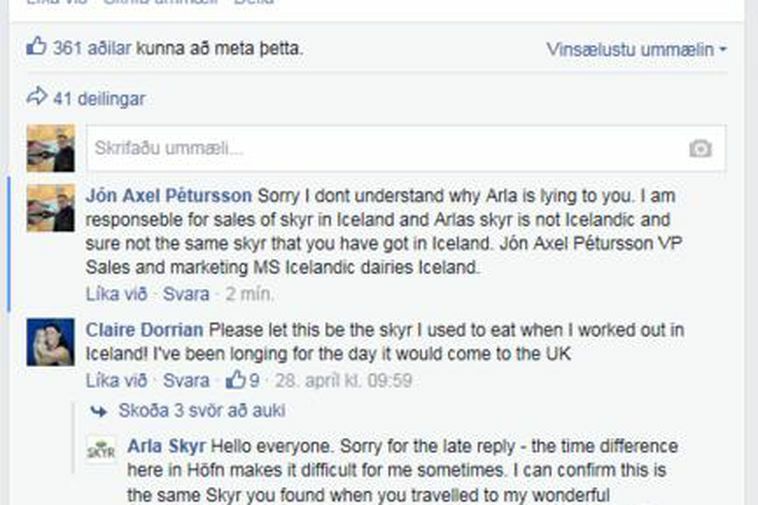 Arla, who are selling their skyr product on the British market engaged in a bizarre converstation on their Facebook page claiming to be a company located in Höfn, east Iceland. "Hello everyone. Sorry for the late reply - the time difference here in Höfn makes it difficult for me sometimes. I can confirm this is the same Skyr you found when you travelled to my wonderful homeland. To find it on your shores, head to your local Sainsburys, Tesco or ASDA now to pick up a pot of Skyr - and in a variety of lovely flavours. We'll also be in Morrisons from 11th June, " reply Arla Skyr to a question posed as to whether the skyr is actually Icelandic. "Sorry I dont understand why Arla is lying to you. I am responsible for sales of skyr in Iceland and Arla's skyr is not Icelandic and sure not the same skyr that you have got in Iceland. Jón Axel Pétursson VP Sales and marketing MS Icelandic dairies Iceland." He also asks where in Höfn the company is situated as Höfn is a small town where noone has heard of Arla's presence there. According to information on Arla's homepage, the company's offices are in Viby in Sweden. Pétursson, when queried by Mbl.is on whether Arla will be contacted on the matter, he replied that the matter is being looked into. He also confirms that Arla skyr has never been sold in Iceland.